MITOGEN-ACTIVATED PROTEIN KINASE 6 (MPK6) is involved in the innate immune MAP kinase signaling cascade (MEKK1, MKK4/MKK5 and MPK3/MPK6) downstream of bacterial flagellin receptor FLS2. MPK6 may be involved in hypersensitive response (HR)-mediated signaling cascade by modulating LIP5 phosphorylation and subsequent multivesicular bodies (MVBs) trafficking. MPK6 may phosphorylate regulators of WRKY transcription factors. MPK6 regulates locally gene-mediated and basal resistance response to certain pathogens. MPK6 may be involved in the cold and salinity stress-mediated MAP kinase signaling cascade (MEKK1, MKK1/MKK2 and MPK4/MPK6). MKK1-MPK6 module mediates abscisic acid (ABA)-dependent CAT1 expression with H2O2 production and response to drought and salt stress. MKK1-MPK6 module is also involved in sugar signaling during the process of seed germination. MKK3-MPK6 module plays an important role in the jasmonate signal transduction pathway through the negative regulation of MYC2/JIN1 expression. MKK9-MPK3/MPK6 module phosphorylates and activates EIN3, leading to the promotion of EIN3-mediated transcription in ethylene signaling. This MAPK cascade also functions downstream of the ER receptor in regulating coordinated local cell proliferation, which shapes the morphology of plant organs. Rabbit polyclonal antibodies were produced by immunizing animals with a GST-fusion protein containing the C-terminal region of arabidopsis thaliana MPK6 (AT2G43790). Antibodies were purified by affinity purification using immunogen. Fig 1. 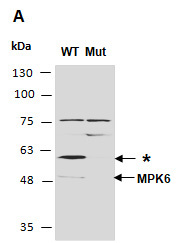 Western blot analysis of equal amounts of protein extracts from wild type (WT)and Mpk6 deficient mutant (Mut) arabidopsis leaves, using anti-MPK6(C) (R3451-2) at RT for 2 hr. The 60kD band indicated by * may represent a phosphorylated/modified form of MPK6 protein.